Most folk who know me, know I love brownies. I’m quite picky about my brownies though – I like a gooey brownie which is not too cakey. I’m not fond of edges or corners (though I’ve had Melt Mud Pie edges and they are *divine*) and I don’t want to taste granulated sugar still in the gooey center. So I’m more than a little bit picky about my gooey brownies and it was with that in mind that I approached the brownies sent to me by the lovely baking duo behind “The Chocolate Ladies”. 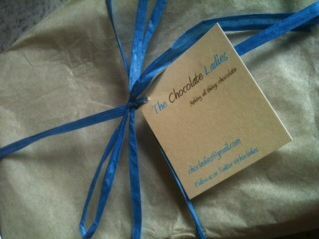 The Chocolate Ladies are two mums with a passion for chocolate. They say that their secret to producing excellent products is that they only cook with the highest quality ingredients. For these two chocolate ladies, it is all about the flavours. Cooking with chocolate and trying out different flavours and recipes is what drives them but they say that the best bit is when other people taste their products and tell them how much they enjoy them. Like me!! The brownies themselves were absolutely lovely. They were filled with lots of whole pecans and a lovely moist and gooey texture. No uncooked batter or granulated sugar here and yet not too cake-like, these brownies were just the right balance. This particular brownie is award-winning and it isn’t difficult to see why – with the moist and gooey centre and the brilliantly baked set, it’s hard to see what’s not to like. They have been baked in a larger pan and cut in half and I was sent half a pan though I am not sure if this was for review only or if it is always a half a ban. Frankly you get a lot and I think you’d need a party to get through a while pan. There is no sugar-dusting on top to the top of the brownie remains in tact. 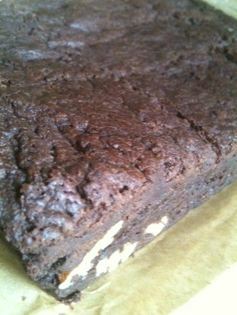 The brownies are moderately thick without being unmanageable and the flavour is delightful. The pecans were whole though I would have probably swooned if they had been smaller caramelised pieces which gave a crunchy textural counterpoint to the gooey brownie. The paper-wrapped half-pan brownies come pre-scored so you know just where to cut and are wrapped in paper to keep them in perfect condition through the post. A slab of these award-winning brownies will set you back £8.95 (plus shipping) for 9 and you can buy them here.